In this week’s episode of the Empowering Ability podcast, I had the pleasure of chatting with good friend, Dr. Jennifer Forristal (aka Dr. Jen). 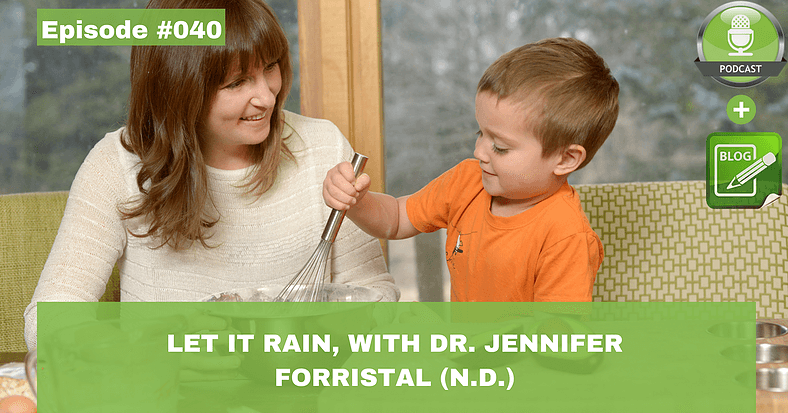 Dr. Jen helps us to understand the approach a Naturopathic Doctor (N.D) takes with a patient, educates us on gluten/dairy/ egg free diets, shares common questions and answers from the developmental disability community, and she shares her amazing work with The Umbrella Project. “Life isn’t about waiting for the storm to pass. It’s about learning how to dance in the rain.” —Vivian Greene. How Does The Umbrella Project Teach Kids? We share the language, and help kids understand what the skill is. We show kids the outcomes of those skills and tell them the research. It is amazing what kids can absorb! We help them go into the world and see these skills in action. For example, when you see someone being resilient it makes you more resilient yourself. On the podcast, Dr. Jen shares how they are teaching parents these skills. What Does a Naturopathic Doctor Offer? Naturopathic doctors (N.D.s) are primary care providers in Ontario. N.D.s have the same training same as a medical doctor for first 2 years including; diagnostics, blood work, etc.. Where we branch off is that we use more natural styles of treatment such as, exercising, eating better, taking the right supplements, stress reduction. There is so much research on how these interventions are effective at treating many different conditions. Naturopaths work to understand the cause of what is going on, rather than just focusing on symptoms. A N.D. spends a lot more time with a patient, and we work toward bringing that person to an optimal state of wellbeing. For example, if someone had a skin condition we would look at things like what is going on with their gut health, not just put a cream on the rash. OR if someone was experiencing anxiety we would spend a lot of time looking at the lifestyle things that would help them come out of that state of anxiety and address the underlying things, rather than just give them a medication to alleviate the symptom of anxiety. There isn’t a cookie cutter approach, and recommendations are always individualized. The research shows a certain percentage of the population responds really well to gluten free & dairy free diets. Eggs come up often as well. It is worth trying this type of diet and seeing if it works for you. You can start to see evidence of positive changes in as little as 1 to 2 weeks. It isn’t something that you have to commit to for a life time. Look for noticeable changes, you might not see the full impact of the changes, but you can start to see results. There is often gut symptom that comes up from eating these foods, and it is easy to see changes in these symptoms. Are There Common Questions You Get from the Developmental Disability Community? Often, when I see these families biggest thing that I see is that parents get very tired and burnt out. The parent brings in the child, and focus shifts to the parent. We discuss getting better balance in their life. If the parents are healthy then it seems to trickle down to the rest of the family. When it comes to kids, sleep is a big thing. If one person isn’t sleeping then the whole family can be impacted. On the podcast, Dr. Jen also discusses the importance of sleep, and provides sleep tips. She also shares how to find the best N.D. for you. A huge thank you to Dr. Jen for coming on to the podcast and sharing her amazing work. If you are interested in learning more about The Umbrella Project, Dr. Jen would love to talk with you about it. The Umbrella Project Curriculum and Newsletter: Click Here.